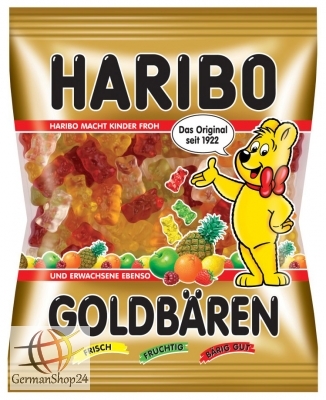 Haribo Gold Bears has been a main staple in German households for many years. 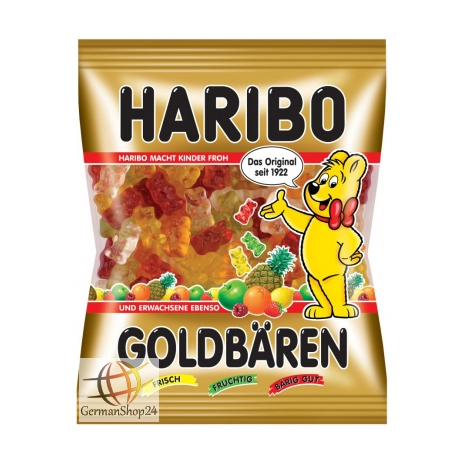 The deliciously cute gummy bears come in 5 fruity flavors such as: apple, strawberry, pineapple, orange, raspberry and lemon. The ideal addition for candy bars at parties, birthdays or just as a treat for in between. How could you resist this original? 200g / 7.05 oz NET. WT. Glucose syrup, sugar, gelatin, dextrose, fruit juice from concentrate: apple, strawberry, raspberry, orange, lemon, pineapple, citric acid, fruit and plant concentrates: nettle, orange, lemon, mango, passion fruit, elderberry, black currant, apple, spinach, chokeberry, kiwi, grapes, flavoring, elderberry extract, glazing agents: beeswax white and yellow, carnauba wax, fruit sweetness of carob fruit, invert sugar syrup. Glukosesirup, Zucker, Gelatine, Dextrose, Fruchtsaft aus Fruchtsaftkonzentrat: Apfel, Erdbeere, Himbeere, Orange, Zitrone, Ananas, Säuerungsmittel: Citronensäure, Frucht- und Pflanzenkonzentrate: Brennnessel, Orange, Zitrone, Mango, Passionsfrucht, Holunderbeere, Schwarze Johannisbeere, Apfel, Spinat, Aronia, Kiwi, Traube, Aroma, Holunderbeerextrakt, Überzugsmittel: Bienenwachs weiß und gelb, Carnaubawachs, Fruchtsüße aus Johannisbrotfrucht, Invertzuckersirup.